"As rare as hen's teeth"
At this stage I am feeling pretty good because I am in the home stretch. If my layout was done accurately from the start, then there should not be much filing to do to achieve a nice tight opening. The first step is to lap the sole flat. Then I take a square and mark a couple of reference lines across the mouth with a fine pencil. Before filing I make sure that my bench lights are set so I get a good reflection off the area that is being filed. When I feel like I am getting close, I put the blade in and hold it up to a bright light. It is important to have the blade lapped and sharpened so I can accurately gauge my progress. In the photo you can see that I am getting close but the blade is not yet protruding through the sole. I keep filing and checking to the light until the blade just peeks through and I can see just a minute line of light across the mouth opening. Now I install the blade and lever cap in the plane and set it to take a nice even shaving. I can then turn the plane over and take a look. At this stage the opening is only visible by sighting through a bright light. This of course is too tight, so I file a little more until I am happy with the size of the opening. A little more clean up around the edges and it’s finished. When I resharpen the blade for smoothing I will ease the edges of the blade more aggressively. 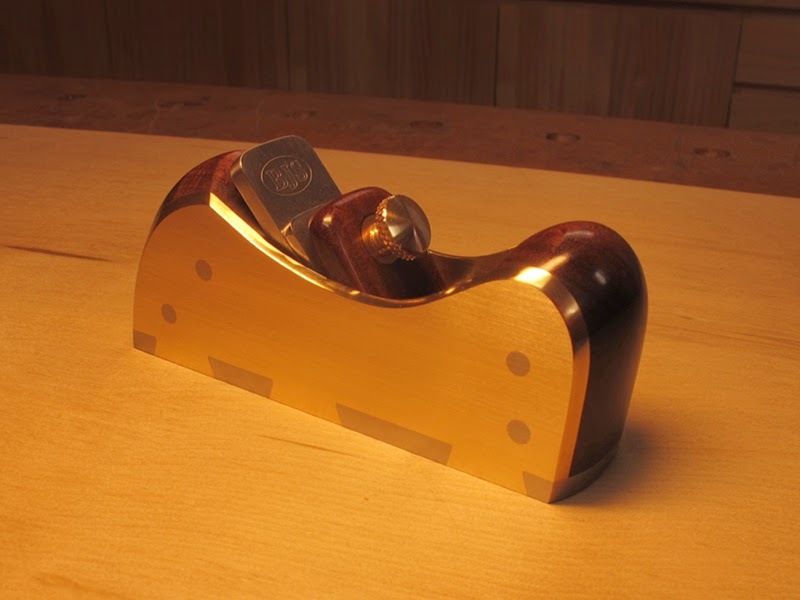 Now I just have to sand the plane, polish up the brass sides and apply the finish. Here are some photos of the finished plane. The sides are naval brass and the infill is a beautiful piece of ringed gidgee.